When I was growing up, there was a thing called “Kraft Cheddar Cheese”. This revolting, yellow foodstuff was nothing remotely like cheddar. In fact, it did not have much to do with cheese, either. As kids, we called it “plastic cheese”, and we were actually close to the mark. The origins of Kraft Cheddar lie with either sacrilege or ingenuity – depends on your point of view. During the First World War, James L. Kraft, a Chicago cheese seller, began shredding all the husks and rinds and discards from the cheddar he sold, mixed in sodium phosphate as a preservative and – voila! – gave the world the wonder that is “American process cheese”. This is the stuff which, to this day, limply sags in the fast-food take-away hamburger. All of which is completely irrelevant, except that when I first heard of the German experimental group Kraftwerk, I immediately thought of Kraft and plastic cheese. And in a strange way, the association is a good one. In the 1970s, Kraftwerk were pioneers in electronic music – pushing the new technologies of synthesised music into a deliberately machine-made minimalism. Their subject matter was, deliberately, the mundane products of modernity. Repetition, mechanical reproduction, the future: these were Kraftwerk’s themes. And the amazing thing? It works! It takes a little getting into, but there is real art here, a jazz-like restraint amid minimalist self-parody. Kraftwerk takes “machine modern mundane”, takes Kraft singles (a plastic box of plastic cheese, each slice wrapped in plastic) and turns it into art. No, I didn’t believe it could werk. But take the time to listen, more than once. This stuff is addictive, subtle, worth revisiting. Unlike Kraft Cheddar Cheese. 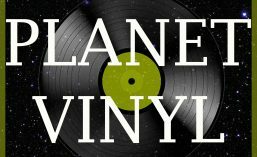 Many of the records featured on Planet Vinyl are for sale on Discogs. Back in the early 1980s, some seriously weird music came out of what was then West Germany. The spirit of surrealism, da-da and futurism thrived, especially in West Berlin, where rents were cheap and young men could dodge national service. So when you find a pop compilation record published in 1981, which has a cow on the cover, and the title Alles In Butter, you expect weird. And weird is what “Everything in Butter” (the title in English) delivers. The pickings are rich. Ina Deter Band, with “Ob Blond, Ob Braun, Ob Henna”? Recht Herzlich, and the majestic “Der Kleine Elefant”? Or someone called Markus, with the, err, incisive social commentary of “Ich Will Spaß” (I Want Fun)? But in the field of West German Weird, you can’t get past Trio. Trio was into hyper-reductionist-minimalism. They took the name Trio, because there were three members. They argued that most popular songs were based on simple structures, and that this simplicity, usually concealed beneath ornate production, should be allowed to shine. Trio did for music was brutalism did for architecture: strip away artifice, lay bare the underlying structure. Show the bones. So, they kept it simple. During live shows, the drummer would keep the beat with one hand, while eating an apple held in the other. The true test of whether a record is both obscure and alternative? You should be able to pick it up and look at the cover, read the words on it, and have no idea what is the band name, and what is the record title. Equal Local (which turns out to be the band) pass this test with flying colours with their 1981 12-inch EP, Madagascar. The words tell you nothing. The cover design is interesting, but also tells you nothing. The only thing I did recognise when I found this record, nestled next to a water-damaged copy of Barry Crocker Sings the Movies, was the label. Missing Link has an honoured place in the history of Australian music (obscure and alternative sub-branch). It was a little indy label, putting out all sorts of adventurous music in the late 1970s and 1980s. Lots of musicians passed through different groups under different names, flowering briefly and then moving on to new projects. In this track, “The Cult Of Simplicity”, the base line sets the scene. It feels like nighttime in a dubious city. Over the top, what I think is a synth (clean, high-pitched, unvarying) and what is definitely a saxophone (sleazy, improvising, dark), engage in a call-and-response. It is stark, moody, troubling. Personally I would call it experimental jazz, but who cares about the label: it is inventive, exciting work. Many of the records featured on this blog, and hundreds of others, are for sale via Discogs. Mention this code “MSD519” before 1 October 2016 to receive a free 7” disc of your choice (up to the value of $5.00) with any purchase.